I use this tofu recipe for adding to stir-fries, rolling up in sushi, and serving with gravy on Thanksgiving. It’s a great, easy all-around tofu recipe that even kids love (my daughter snacks on cubes of baked tofu). Slice tofu 1/4-inch thick. Brush each slice, back and front, with soy sauce and allow it to marinate for 10 minutes. Place on a lightly oiled baking sheet and bake for 30-35 minutes, turning once halfway through, until a deep, golden brown and crispy on the outside but still tender on the inside. Remove from oven. 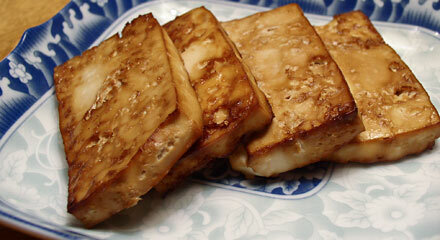 If using in a stir-fry, cut each slice of tofu into 8 cubes and add to stir-fry near the end. For sushi, cut tofu lengthwise into about 6 thin strips. Roll up with rice in nori rolls. Slices of baked tofu are great served with a “chicken-style” or mushroom gravy. Add 1 tsp. sesame oil to the soy sauce for a great addition to stir-fries. Add 1/4 tsp. of poultry seasoning or rosemary for a vegan turkey substitute. I made the baked tofu to add to a stir fry for tonight’s dinner. I hope there’s some left for later! It is so good by itself, I ate half of it!!! Thanks for reminding me about baked tofu, it’s a fave of my family anyway. I wasn’t thinking that it could be used as the Main for Tday, WITH GRAVY, but, WHY NOT?? My son loves it, I love it, what’s not to love? OH YEAH! I’m searching for the mushroom gravy recipe and cannot find it… help? Made this last night to add to my bok choy-based stir fry. Very easy and it turned out great. I am in love with tofu again thanks to this recipe. I sprinkled it with a little garlic powder and ground ginger with the tamari. I ate a slice right out of the oven! Thanks!! This recipe is super easy to use, for the first time of me attempting to make tofu, it came out great!! Now I’m having fun with it! This worked great! And it was delicious. I’ll never buy baked tofu again. Thanks! I just wanted to tell you that and also let you know I’m totally using this recipe for dinner tonight! Thank you! I wonder how this would be with ponzu sauce? We love this too! Just made some this AM from sprouted firm tofu. I do press it, cut into chunks, pop in a baggie with tamari (wheat free), black sesame seeds, garlic and sometimes a bit of maple syrup or liquid smoke. Let sit for a day and then bake. Chewy and satisfying! On top of black rice, salads etc. So good! I will definitely be using this recipe! I’ve already shared it on all my networks. Keep ’em coming! Thank you so much. This has changed my life. Thank you. This baked tofu recipe is fantastic. It is one of the few recipes I use over and over. I could eat a whole pan of it at once. I am an idiot in the kitchen. This simple delicious tofu prep. is a lifesaver. Thanks. THE BEST BAKED TOFU EVER! Bake 20 mins at 200 degrees c.
Is this anything like Pei Wei tofu? I’m in LOVE with that tofu! I actually really like tofu in most things, but the pei wei tofu is my holy grail. Yes. It may be a little chewier after freezing, but most people like that. Will this freeze well after baking? I am thinking about doing some larger batches for future quick easy meals. I marinaded firm cubes of tofu in coconut milk which I then used to make a mild vegetarian Thai curry. Delicious! Pressing it will make it chewier, but I don’t really find it necessary. I just dry each slice well befor marinating. does the tofu need to be “pressed” to remove the water or is that redundant since it is being marinated and then baked? Has anyone tried marinating tofu in coconut milk for a sweet kid friendly taste? my 6year old just asked for baked tofu tonight for dinner…again. I use a soy teriyaki mix. then stir fry w/ pineapple and red pepper. over rice. BTW we do eat meat on occasion, so he is not a full vegetarian, more like “flexitarian”. It’s tofu by choice in our house. I’m trying this for the first time and I just love it so much. I was sure to put lemon juice in the marinate which made it more tastier. I made this and added a little teriyaki sauce; it was the perfect topping to a large salad. Just made this to add to a veggie medley for lunch tomorrow. Tried a little piece and it was delicious!! I used reduced sodium Tamari and lite tofu. Very simple, mild flavor that goes with anything. Thanks!! I add in ginger, garlic, sesame oil, red chili flakes and scallions in the marinade. It’s delicious! amazing in a spinach salad with garbanzos, carrots, sprouts, broccoli, nuts, roasted tomatoes, avocado, and mushrooms. yummy with fruit salad made of blueberries, mangoes, and grapes! As suggested in the bibimbap recipe, this is an excellent topping for it. Yum! My husband wants to keep it on hand for other recipes and dinners as well which is a bit unheard of since he’s not the biggest tofu fan. We often have it with gravy, mashed or baked potatoes, salad, and a vegetable. It’s great with any grain or potato dish (or mac and “cheese”) because the flavor is mild and goes with everything. What would be good to serve with this to make it a whole meal? Thanks! this is a new staple in my household. i love the texture and flavor and use the tofu in everything from pasta to salads and wraps. so delicious! And enough saki to cover. Marinade in refrigerator for a few days then bake. Enjoyed my first ever cooking of baked tofu and salad. After draining & drying with towel I poured olive oil over then Tamari Sauce. Next poured onion & garlic over. Put it in the oven to bake for 45minutes. Halfway through turned it over it came out great to my surprise! Have it once a week at the start to get used to it. God bless. I do something similar on the stovetop which is good if you’re in more of a rush. I cut the tofu into cubes and steam-fry it in a mixture of soy sauce and water (about half-and-half) in a nonstick pan until it’s a bit browned. It takes about 10-15 minutes. Got an invite to look over the redesigned site, and this looks easy and fabulous, and I’m up for both. Thanks. This was SO simple, but totally delicious! I marinated for a bit longer (about a half-hour) and used a bit more soy sauce (probably about a 1/2 cup), then after baking I added it to your ” Stir-fried Tofu and Vegetables with Miso” recipe. It worked great! I’m still really new to cooking, and this website has really helped me get my ‘sea-legs’. Thanks for all the fantastic recipes!